Overhaul to provincial system ? After examining the provinces in ancient Han China, there's only 13 provinces. With over 35 - 40 Unique characters and a coupled hundreds generic ones, I think the provincial system needs an overhaul. Province (Governor) > Commandery (Administrator) > County. 1.A Province consists of multiple commanderies (More the better). Clicking on provincial capital will show the commanderies under the provincial jurisdiction. A governor can be appointed and will be the superior officer of all the administrators (commandery) under the province. Has taller walls & bigger garrisons (Refer point 4). 2.A commandery will probably be the equivalent of a province in ToB. Clicking on the Commandery settlement in the campaign map will show the counties around it. An administrator may be appointed but can be left empty. County with administrator will get the administrator buffs and counties without will receive buff from the governor. Has less garrison and slight inferior walls to Provincial capital. Administrator might be given to a lesser character to increase loyalty despite governors having better buff. 3.A County is part of a commandery. Has no garrison. Consists of multiple visible settlements within the commandery borders. Can be sacked and occupied like in ToB. Counties can also be awarded as fiefs to followers who are meritorious but a portion of the tax revenue will be an opportunity cost. "Special" counties may award the title "Marquis of ABC county" and additional fiefs may be given to existing marquis. 4.There's another issue in my mind right now and has bothered me since Rome 2 till Warhammer. Sieges are too easy especially on smaller settlements. I hope Provincial capital in 3K are really hard to occupy even in easy mode. One way to make the mechanic interesting is, players must occupy the commanderies in order to weaken the defenses of the provincial capital. Say, there are 10 commanderies in a province, each commandery occupied will reduce the provincial capital strength by 5% hence occupying all 10 will reduce the strength by 50% of the provincial capital and will make the siege easier. However, the AI must make attempts to recapture the commanderies and defend it. Commanderies may also raise army to aid a besieged Provincial Capital. Commedary would obviously the ‘provincal unit’ in 3K, what I’d like to know is whether they will attempt to ‘translate’ the meaning of their respective names. People would recognise ‘Ba east’ or ‘River east’ much better than ‘BaDong’ or .JiangDong’. What I fear is the systematic and continuous trivialisation of walls as a defence, if previous gameplay footage is any indication, infantry could spiderman polevault his way up a 10m high wall in 3 seconds with no prior preparation. But when they square up against a block of loosely connected huts? Oh no, no way we could traverse this, how could anyone hope to overcome such a formidable defence? Its same goddamn issue with rivers and oceans in previous games, my army needs a bridge or fording point to cross a random river in the middle of no where. But when my army came up against the English Channel, they simply pull out a fleet from their behind and crosses it like a perfect flatland. Its such a bloody joke, they have been trivialised them so much that they are function worse than their lesser counterpart. Yeah, it seems very likely to me that "Provinces" in this game will probably be renamed and represent Commanderies or larger counties. I also have a feeling that they will go back to the Shogun 2 system of having just 1 walled city per "province" instead of minor settlements being a thing. Just based on the brief province outlines we saw in the campaign map flyover. It's like the left hand doesn't know what the right's doing. Wonder how many unique maps Three Kingdoms will have. ToB has 16 even though it's only a Saga. Three Kingdoms is a major game therefore it would have more unique maps. I hope that's work in progress, the campaign map looks quite empty. Shogun 2 system will be a step backwards. Shogun 2 is a great game for its time and age (Myself had almost 900 hrs) but R2 and ToB had some great improvements. Reverting back to S2 is a step backwards. Don't worry, you will get the maps to represent the various terrain in China. My only hope is to see some fresh new changes to the campaign especially the provincial system. Make it hard, fun and rewarding to occupy and control a province. Owning a province in 3K is a big deal, it is almost equivalent to a state (I mean large state, look at the Roman Empire for comparison). Yea, please no Shogun 2 style provincial system. If you have any sense of the geographical scale & bureaucracy of China and Japan, I think TW3K deserves an overhaul. If they plan to keep the provincial system as-is, I'd think they'll just divide provinces into subdivisions and call it at that; I'll call them Counties for lack of a better differential term. Actual Han empire provinces aren't really relevant to how the game would function, anyways, seeing as from turn 1 everyone's either trying to take pieces from eachother. They can differentiate from actual Han empire provinces from Counties, by simply having Estates requiring control of the entire Han province, so for instance, in order to gain the Estates titles for the Han province of Yang, you have to take all the Counties that make up Yang. Thus, some provinces have smaller or more counties, making them more or less easy or valuable a priority. That, or they just subdivide the larger provinces between prefixes like North Yin from South Yin. At least seven provinces n the OP's screenshot can easily be chopped up into two, or even four pieces, maybe even more. Seeing how close the walled settlements are to one another in the trailer. I think we are might be getting the TOB or S2 system. I have mixed feeling about R2 system, but personally still prefer it over the S2 system. Sharing a strategic view of map from shots taken at E3 by anonymous. After much thoughts and recall, I think S2 province will not make it into TW3K because I remember hearing the devs mention governors in their gamescom interview. So, we can at least expect a Attila or ToB style province mechanic. Would be cool though if some strategic or "frontier" cities could assign administrators. 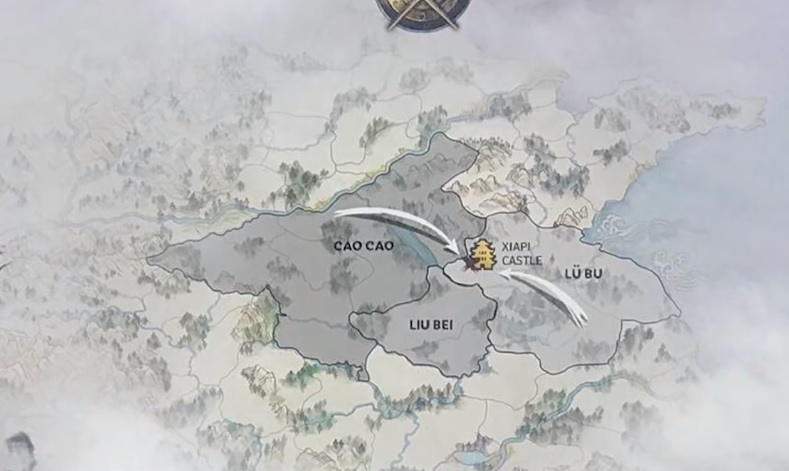 On that image you can see that Cao Cao’s territory got 8 lets say counties. Maybe that is one province with 8 counties, and every countie got one walled city and few small ones like in ToB. What do you think? Those might be commanderies forming up the province. But I feel we might see a hybrid of S2 & ToB provincial system. Who knows, only time will tell. I dont mind it beaing hybrid of S2 and ToB as long as they give us chance to apoint characters not only as a governer of province, but as administrators of smaller cities aswell. I think I heard somewhere that the Provincial system would be tweaked a bit. They might go for a combination of Empire/Shogun 2, Rome 2 and Thrones of Britannia; you still have provinces made of up of 2 to 4 regions, with one of them being a walled Provincial capital. But instead of everything being contained in the settlement, some special resource buildings - like mines or farms - are spread throughout the region. Those "dispersed" buildings are locked and can't be changed from what they are, but you can still build whatever you want the actual settlement itself. So you might have a settlement with 4 building slots, and two of those slots are occupied by a mine and a farm which are in the surrounding region outside the settlement. But you still have 2 other slots to build what you want, like a barracks or a temple or something. That way, you could raid undefended buildings in the region, damaging the enemy's infrastructure and capability to wage war, but without having to fight the garrison in the settlement, like in Empire, Shogun 2, and ToB. While also keeping the traditional Province system introduced in Rome 2. They might go for a combination of Empire/Shogun 2, Rome 2 and Thrones of Britannia; you still have provinces made of up of 2 to 4 regions, with one of them being a walled Provincial capital. But instead of everything being contained in the settlement, some special resource buildings - like mines or farms - are spread throughout the region. Those "dispersed" buildings are locked and can't be changed from what they are, but you still can still build whatever you want the actual settlement itself. Oh, your English is perfectly fine, man, don't worry about it. Oh, I'm sure there will be plenty of walled settlements; that campaign map flyover looked like only a small portion of the map. The question is; how many walled settlements will there be? It might just be major settlements have walls and minor settlements don't, like in previous games. Perhaps you may have to build the walls in the major settlements yourself? As I understand it, one of the big complaints in Rome 2 was that garrisons were too weak (especially in minor settlements). And in Warhammer there could be too many walled settlements, as you could build garrison buildings everywhere, leading to too many siege battles. Personally, I really hope they go back to something like Medieval 2's garrison system, with a little tweaking. So, for Three Kingdoms a barracks (or stables) would not only allow you to recruit units, but also give you a "professional" army garrison in that settlement, and the quality and quantity would increase with the building tier. That's a little off topic though. I like how you are thinking. But if i understood it well, they said that recruitment was now tied to caracters, not buildings in settlements. They said that every type of character would be able to recruit specific units. Did they meant by that that you wont need specific buildings for specific units? Or maybe you will still need buildings in order to recruit units? and having too many siege battles isn’t fun imo. I don’t like how they dealth with it in Warhammer. Just making every small settlement siege battle into battle outside the walls isn’t realistic, not the right way to do it. Either dont make it garrisoned settlement or make it like in ToB mines and farms, or on the other hand they could remove that feature that every new army is more expensive to maintain, i hated that. Just having more armies on the field will lead to more filed battles and ambushes. Do you agree? Yup, I think this is pretty much a good solution. A province being made up of few regions (equivalent to commandery) including capital region. Each region cities would have building slots which represents a county, say a farm is visible in the region of the campaign map and can be raided like in Shogun 2. Governors with military prowess will give defensive buffs to the province and better garrison when under siege and "strategist" or civil type will boost revenue instead. I don't think we know all the details yet on unit recruitment just yet, but yes, from I what I understand so far, characters can recruit special and high tier units like the Azure Dragons without the need for buildings, but you might still need a barracks to recruit basic units, like regular Swordsmen, Spearmen, Archers, etc. That's just my theory though, it's not confirmed. Yeah, the sieges in Warhammer became very frustrating very quickly for exactly those reasons, especially as it was too easy to build garrison buildings. But the lack of defenses in minor settlements was something a lot of people didn't like in ToB. The good thing about it though was that it did lead to more open field battles, which was definitely more fun. The way I'd like to see garrisons work in this game is that they are dependent on the level of buildings. In minor settlements you wouldn't be able to build walls, but you'd still be able to have a decently sized garrison in the settlement (as long as you developed certain buildings), but if attacked it would lead to a field battle or a battle on the outskirts of the settlement. Yeah, that's exactly what I'm getting at! And if you developed military buildings in the settlement to give you a decent garrison, the character assigned to administer that settlement would also be part of the garrison and fight in battle if it was attacked!